Planning your Vermont vacation to Sterling Ridge Log Cabins? There is a lot going on this spring starting in March. Maple syrup isn’t the only thing to check out on your Vermont vacation. 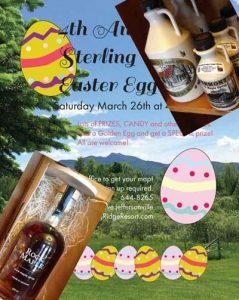 If you are visiting Sterling Ridge Log Cabins this March you may want to take part in their annual Easter Egg Hunt. Come celebrate spring on your Vermont vacation with candy and lots of other surprises. Who knows, maybe you will even win a jug of Vermont maple syrup! Egg hunters can explore the trails at Sterling Ridge and even get a look at a working sugarbush! Interested in attending the Easter egg hunt? Plan your Vermont Vacation for the weekend of March 26. Need another sweet idea for your Vermont vacation? Check out Magic Hat Brewery’s 21st Mardi Gras Weekend. No need to travel all the way to New Orleans to celebrate. Only about 45 minutes away from Sterling Ridge Log Cabins is a Mardi Gras Celebration fit for the young and old. The celebration includes music, food and a parade with dozens of floats in Burlington. To learn more information, such as times and events, please visit their website.